Recently, we had the opportunity to catch up with Laia and Aitor from The Van Effect. A road trip through Spain and Portugal inspired these two to build out their own campervan conversion and move into the van full time. We discuss research, the construction process, and looking forward to life on the road. What type of van do you own and what made you choose it? We have aPeugeot Boxer L2H2. We checked on a lot of different models before getting this one, at first we looked at many WV as it has always been considered ‘the van’ and we were completely in love with them. But then the cons started popping out because our plan was to move in full time and we wanted to be comfortable in our home while traveling. We wanted to be able to stand straight inside and have enough room to move around a little bit if we had to spend a lot of hours or days inside as well as having enough storage for everything we needed to take as we will also be working while we are on the road. So we started looking for sprinters but the prize was too high for us. The van that we found was way cheaper and just as good. It was in good conditions so we decided to get that one. We are really happy with our decision so far. Did any unforeseen issues pop up after you bought your van? Not one! And let’s hope it stays that way for a long time hehe! The van was used by a company who worked in builds so the inside was full of dirt and grease but other than that which we only had to properly clean we’ve never had any problem with it so far. It has only had to go to the mechanics for the basic oil changes and such. We spend A LOT of hours searching for information and inspiration literally everywhere, YouTube, Instagram, websites from other van lifers, groups on Facebook and many more. We got in it with really zero knowledge on how to proceed to convert a van so we spent many hours training ourselves with tutorials, checking forums for opinions, reading the mistakes that other people had done but even with that, how we learnt the most was by making our own mistakes. We had an initial idea of our needs and must but we didn’t really start with a floor plan. We built the bed and from there we started ‘playing tetris’. We made a lot of mistakes during the build and we learnt from them, there’s plenty of wood that we used that ended up in the fireplace because we had never worked with wood before and fucked up a lot in the beginning but for us it’s been a long process and in the almost two years that it has taken us, well… you end up knowing what you are doing. What do you think is the most difficult part of the construction process for you? In our particular case, might have been the electrical system followed closely with the water one. Both our systems are quite powerful because we wanted to be completely self-sufficient while traveling. And once again, everything very much thought on the go… Like we started with a simple water system but we saw after having used it for a while that it was not what worked better for us having in mind that we were not only going to use it on holidays, so half-way during the conversion we upgraded it completely. Because we both worked part time and were still studying while working on the conversion of the van in the little free time that we had, we are very lucky to have had help from Aitor’s father in this matter. If we were to do it ourselves it could have taken us even longer to have everything ready so thanks to his guidance we could learn everything much quicker and the right way since the beginning. 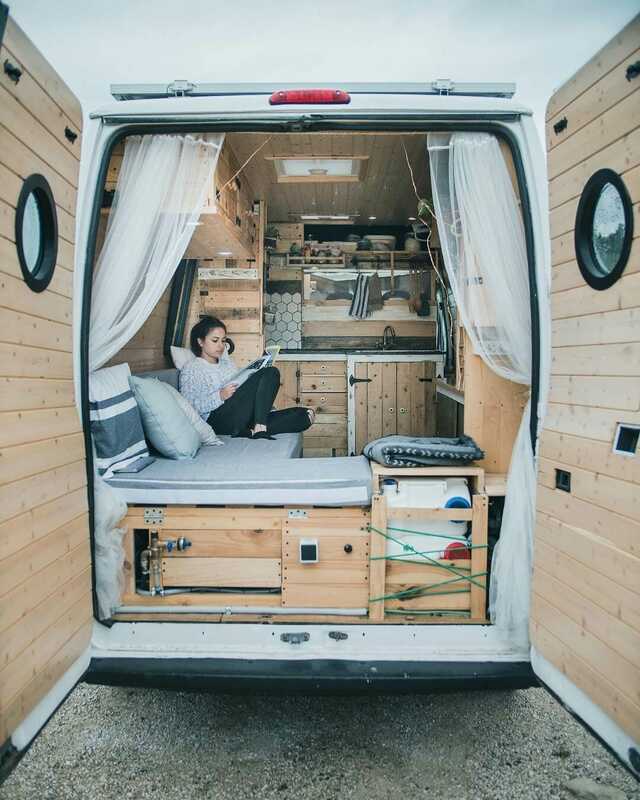 How long do you plan to live or travel in your van? We start this journey with no return date and no plan. We want it to take as long as we feel it’s right and that we won’t know that until we are doing it. We’d like to travel and experience everywhere without any rush. If we stop somewhere and feel like staying there for a month, two or even a year, why not? As long as we feel comportable and it feels right. We are not going on holidays, we will be working just as we work living in a house so there’s no stopping when we run out of money as our intention and what we have also been working on alongside the build of the van is to prepare everything to keep a regular income while being on the road. If this is going to work and allow us to do it for a year or a life time only time will tell. What is your favorite feature in your van? That’s very difficult to tell!!! We deeply love our van as a whole hahaha. Maybe what gives it more character is the set up of the kitchen as it’s unique and extremely functional. We also love the portholes in the back doors combined with the curtains and the lights and of course the little details of the tiny gardens and the screen to watch films. Our shower’s also pretty awesome and we love using it. I can continue but i’ll end up saying EVERY. SINGLE. THING in our van hahaha sorry… We feel very comfortable with everything inside, we really managed to create a space that is has so much about us and our personalities that it’s extremely difficult to decide on one thing. What do you think the hardest part about van life will be? Related to the actual living in the van very little! We both have shared small spaces before and we know each others limits and comfort zones very well, we love traveling and experiencing new places, people and cultures so we are very eager to jump in this whole experience. Of course we know we will face many challenges and not everything is sunshine and rainbows but van life give you way more than you have to sacrifice for it. We adapt to every situation very easily and we are positive we can overcome any difficult situation. For every problem, there’s always multiple solutions, we just have to keep an open mind and accept that not everything has nor it’s going to be easy. Luckily we have set up a space where we have all of our needs covered and even more than what we need. On the other hand, what has us not worried but with a feeling of uncertainty maybe, is how we are going to manage our business. We feel prepared and worked very hard for a long time to set everything according to our situation but of course, we have never experienced running a business online from different locations and that is going to be a challenge for sure. We are very confident and eager to make it work, as we said before, there’s always multiple solutions to a problem and we can’t wait to challenge ourselves in this matter. Where are you most excited to take your van? Hahahah where to begin?! Each place has its thing! Asia? Africa? Everywhere! We’ll start with Morocco and then Europe as it’s the easiest for us to begin with. But maybe what we are most exited about in the beginning of the trip is to get to Norway, we both have always wanted to experience that breathtaking country. That’s Aitor’s top location and I share it as an extremely important one as well. But since I was a child my dream trip has always been Egypt. I grew up a freak of all the stories about pharos, the legends and the mummies, the pyramids and all the culture from that country so if we get to take the van there it’ll be a dream come true for me. Then we’ll both have other countries that will be where we will be most exited to take the van to 🙂 I think that’s a feeling you never get rid of. What is one piece of advice you would give someone thinking about starting a van build? Know what your needs will be, study your must haves in the van and maybe start with a bit more of a plan, which we didn’t do and not that we regret it, but it would have saved us some money. Ask, compare, search and search again! Unless you have previous experience in building a van knowledge is key, the experience you’ll acquire it on the go. We looked for a van in many different platforms, it’s second hand so we checked all second-hand platforms for vehicles that we knew, and eventually found a dealer through second hand platforms in a town nearby. It’s a company that buys all the vehicles in auction from other companies that have to close so it had good deals. We didn’t keep track of the exact amount but 10.000€ approximately. Thank you so much for having us on your website! Lots of love! Thank you for sharing your story.My girlfriend and I also converted a van to live and travel in.we have been on the road for 3 months now traveling the northeastern states of America and have enjoyed every second!! It’s great once you get into the rhythm! Congrats on making it on the road!